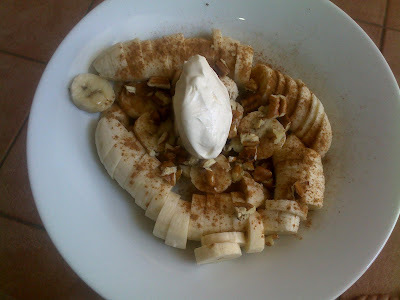 This has got to be one of my all-time favourite healthy gluten-free breakfasts/desserts/snacks, which when made by my sweetie-pie hubby always tastes a million times better than if I had to make it myself (it must be the love). a dollop of double-cream plain yoghurt. Go ahead and try it - you might just be pleasantly surprised at how tastily it destroys sugar cravings! ooohh sounds yummy, off to the shop, be back in a jiffy. "It must be the love"- Sure is! I heard cinnamon is the no.1 scent to love...next is cucumber!